Apple on Monday announced it will be revealing results for the fourth fiscal quarter of 2012 on Oct. 25, to be followed by the an earnings conference call expected to detail the initial sales performance of the company's newest handset, the iPhone 5. 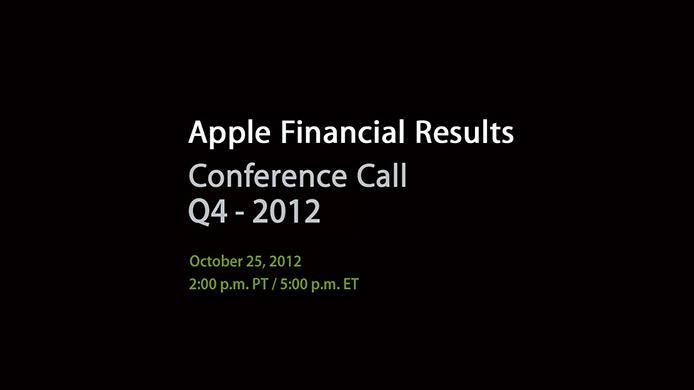 In an update to its Investor Relations webpage, Apple noted the results statement and ensuing conference call is scheduled for Thursday, Oct. 25 at 2:00 p.m. Pacific/5:00 p.m. Eastern, and can be streamed live here. For the third fiscal quarter of 2012, Apple's earnings were buoyed by record iPad sales, which grew reached 4 million units for the quarter ending in June. During the call, Apple CFO Peter Oppenheimer revealed that weekly iPhone sales were being negatively impacted by new product rumors, though the exact financial impact was "difficult to sort out." Despite the rumor mill's hit to sales, iPhone sales grew 28 percent from the year ago period to end June at 26 million units. It is unclear how well the iPhone 5 performed, but Apple announced that 5 million units were sold during the handset's first weekend of sales after pre-orders for the popular device sold out within one hour of availability. Final iPhone 5 sales for the fourth quarter may have been negatively affected by reported component supply constraints, including shortages of the new in-cell touchpanel displays.